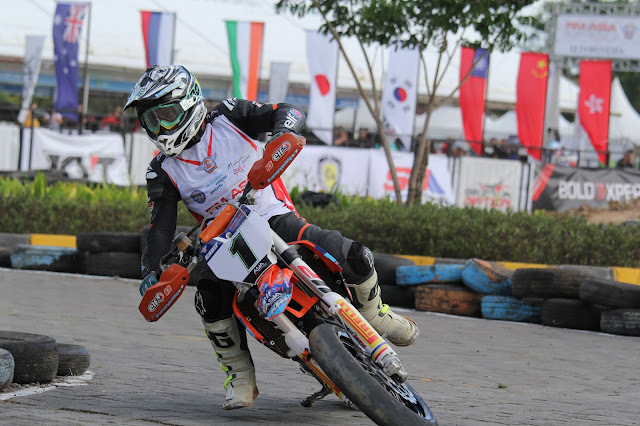 Malaysia’s SuperMoto ace, Muhd Habibullah or better known as Gabit, will be absent from the 2017 FIM Asia SuperMoto Championship – Taiwan after a motocross accident that ruptured his lungs last month. This will leave his Malaysian comrade, Khairi Zakaria, to a lonely fight for the overall championship title. “I am sad because I won’t be racing in Taiwan. Doctor has advised me to rest temporarily for my lungs to heal. However, I would like to thank my fans, sponsors, Team KTM Malaysia ELF Racing and the organiser for their understanding and support. I will return stronger to compete for the overall standing and to make Malaysia proud again,” said Gabit. The 2017 FIM Asia SuperMoto Championship – Taiwan will take place on Sunday, 19 November 2017. For more information, visit www.supermotoasia.com. Global live stream available on www.twenty3.tv powered by E-Plus Global Sdn Bhd.